When I told my daughter the story of Abraha and the elephants that tried to attack the Holy Kabah, my daughter was enthralled. She retold the story many times in the following days, as she was processing and learning. When I told her this story, we first went through the story, discussing what happened. After that, she retold the story to me in her own words, explaining what she had understood to me in her own words. I wanted to make the story come alive for her, so we used PlayDoh and mini cookie cutters to create the story visually. 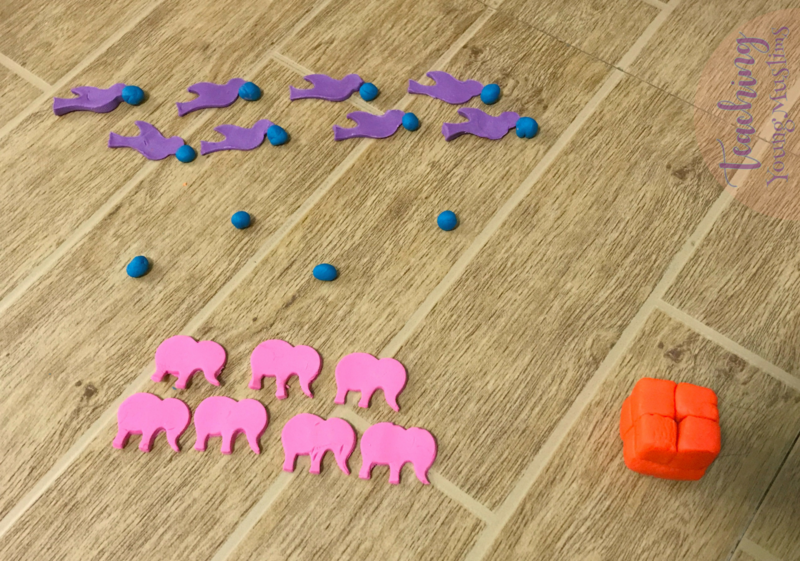 We made a cube to represent the Holy Kabah, and then used a different color to cut out the elephants that were headed towards the Holy Kabah. Allah (SWT) sent birds to defend against the army, so we used our bird cookie cutter to cut out birds in a different color. We then rolled up tiny “stones” that the birds dropped on the elephants. After all the elements were ready, I arranged the PlayDoh creations as a cohesive visual, then I asked my daughter to explain to me what was happening in our picture. She could explain to me that the “bad person” and the elephants were going to try to break the Holy Kabah, but Allah (SWT) was protecting it. Allah (SWT) sent birds with rocks to stop the elephants. How have you made historical stories come alive? I’d love to hear – let me know by leaving a comment below or sending me a message!